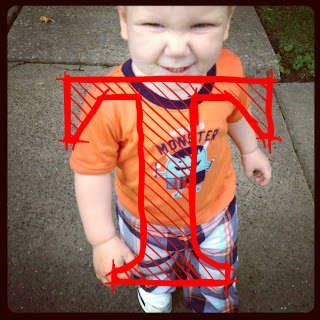 While talking with a fellow mother of a toddler, I made the joke that my toddler put the T in Toddler. Then I started rattling off a whole slew of other T words that my toddler fits, well, to a T! Here are 10 of my favorites, and for an added bonus, I added the actual definition of the word from the Merriam Webster dictionary, to show just how true these 'T's are! 1. Terrorize: v. To cause (someone) to be extremely afraid. If it's not what my toddler might say, it's what he might do that keeps me VERY afraid! 2. Tester: n. One that tests or is Used for Testing. Nothing gets by him without his own investigation. He needs to touch, question, play with... everything must be tested! 3. Traitor n. 1. : one who betrays another's trust or is false to an obligation or duty 2 : one who commits treason. A Toddler will throw anyone under the bus. If they are not calling out someone, they are telling their business. 4. Talkative: a. Tending to talk a lot or to enjoy having conversations with people. HE NEVER STOPS TALKING! 5. Tameless: a. not tamed or not capable of being tamed. The child cannot be tamed. Nope. It can't be done. 6. Tantrum: n. an uncontrolled expression of childish anger : an angry outburst by a child or by someone who is behaving like a child. I'd say Merriam and Webster pretty much just summed it up. 7. Tardy: a. Slow in moving, acting, or happening. For some reason when I tell my toddler it's time to go, he hears, sit down and start playing with toys. 8. Truthful: a. containing or expressing the truth A toddler will tell you anything you want to know. They will even tell on themselves! They will also tell on you, so beware. 9. Thieves: n. One that steals especially stealthily or secretly. 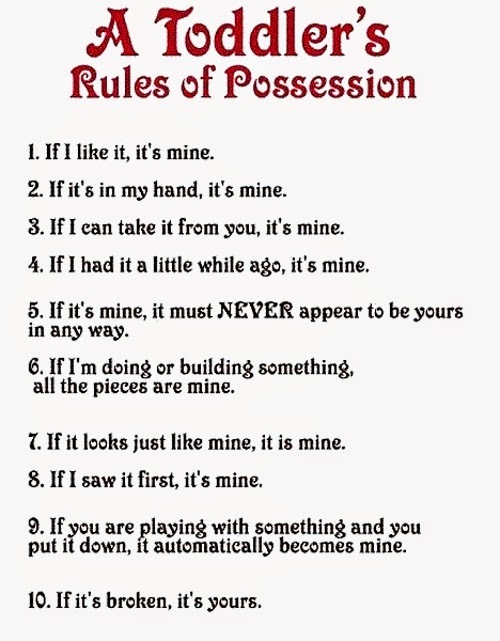 You have seen the toddler Rules of Possession right? 10. Theatrical: a. Behaving or done in a way that is meant to attract attention and that is often not genuine or sincere. Oh My Lawd! The theatrics! A toddler can give an Oscar winning performance at the drop of a hat. It's pretty amazing really. A toddler can go from full tear meltdown to excited and laughing back to meltdown. On queue they can do just about anything... but go to sleep of course.